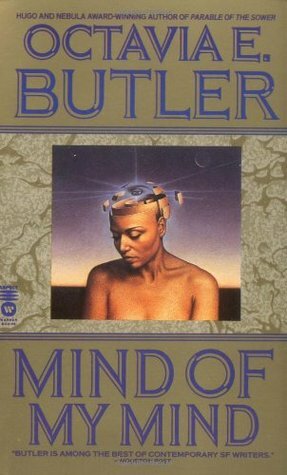 Review: “Mind of My Mind” by Octavia Butler – Mandaray Reads! Final Rating: Five cups of desperate, apathetic tea. Crouching in front of one of the many “Science Fiction” shelves of my local library, I had no idea what to expect when Butler’s name caught my eye. Seeing her brought back memories of reading a blog post somewhere about highly influential and talented sci-fi writers that not enough people knew about. I remembered feeling upset that no one had ever introduced me to her works when I was younger: during my teen years, I never even realized that women were “allowed” to write science fiction. It seemed like the only way to experience sci-fi was to read about men who did everything and women who were violated a lot. Worse yet, very little of the sci-fi I consumed growing up had anyone in it who wasn’t white–what few PoC that did show up were often relegated to the shadows. Excitedly, I grabbed up two of Butler’s books and took them home with me. Reading Mind of My Mind was tough at first. I don’t think I’ve ever seen characters so thoroughly apathetic about each other before. At best, they see one another as tools to be used…at worst, they think of everyone around them as completely disposable. Despite this, I still found the characters compelling. I think in the hands of most authors, this sort of apathy would have been stifling and awful to me. But Butler wields it masterfully: Their complete disinterest in one another as human beings is like a knife that cuts through the usual tangle of which characters we’re meant to sympathize with, and which ones we’re meant to hate. There is none of that in Mind. There are only the characters themselves. If they are archetypes, they are well hidden. Each one brings with them their own backpack of awfulness, and if you really want to play the Sympathy Game, you will lose. Almost every single character in this book engages in some type of violation: Enslavement, murder, treating humans like literal cattle, apathy, emotional abuse & manipulation, violence, hatred…the list goes on. And yet, I found very little of it triggering. I did not experience the kind of slimy, panicked closeness in my own skin that I get whenever I’ve read other works where the point is to make you choose favorites among those who do evil things. It was tough to read, but it wasn’t painful to read. I don’t know how Butler managed this, but it amazes me. Maybe it’s because their awfulness isn’t gratuitous…it simply is, and is never romanticized as being more than just how these characters are. There were a lot of themes in Mind, many of which I probably missed. Slavery and the concept of a “disposable people” was the most prevalent. Each character engages in enslavement in their own way; some of them are using miniature enslavements as a survival technique, while others are using it on a grander scale for personal fulfillment. Some don’t seem to have any choice but to enslave. I found it very interesting that Butler never attempts to sugarcoat what’s happening. The characters themselves (with a few exceptions) try to ignore what it is they’re doing, or try to justify it: But the book itself never does. As a white person, slavery really isn’t a topic I’m qualified to comment on, so this is as far as I’ll expound on this point. The book makes its messages in this area clear enough without me needing to add to them, anyway. Something else that had me cheering (though using that word in relation to this book feels…odd) was watching someone finally take telepathy seriously, rather than turning it into some fun party trick or something you use to order pizza with when you’re comfortable on your couch watching Netflix. Almost all of the characters in this book are telepathic in some fashion, and Butler makes it clear that this is no picnic. Something that’s always bothered me is how very few authors seem to take into account that telepathy is also a form of empathy; you are literally a conduit for other people’s emotions. In Mind, there are many times when a character will suddenly pick up on a traumatic event happening nearby, like someone getting in a car crash, or someone beating their spouse. They feel the pain and the agony of these events as vividly you’d expect them to. Of course, there are defenses characters can mount against these unintentional mental assaults, but their effectiveness and strength varies. For the book’s “second class” of telepathic citizens, Latents, this ability is nonexistant: They are forever doomed to pick up every piece of mental trash floating by. I found the play on mental illness here very interesting. While there is definitely a strong element of ableism present in this particular subplot, I appreciated how the book makes you rearrange your assumptions about destructive behavior, and how often it’s a coping mechanism rather than something malicious. Not enough books try to challenge the reader’s perception of “crazy” behavior; in fact far too many sci-fi books I’ve read trade on it wholesale, using it as an excuse for why an antagonist antagonizes and reason why the protagonist has to stop them. Spare me. To be honest, I could go on and on about the many fascinating details in Mind of My Mind, and the myriad of feelings it produced in me. But it already seems like I’m barely doing the book justice, and there really is so much in it that I can’t readily express here. Go read it. It’s bleak, frustrating, and at times straight-up depressing…but it’s good. It’s so good. I will be returning to Butler’s works VERY soon. This entry was posted in Book Reviews and tagged book reviews, five star rating, Mind of My Mind, Octavia Butler, sci-fi, science fiction, suspense. Bookmark the permalink. Pingback: Review: “Parable of the Sower” by Octavia Butler | Mandaray Reads! Pingback: Review: “Touch” by Claire North | Mandaray Reads!